See also our Events page for Venice's big annual events and festivals, and our Entertainment page for listings of theatres, year-round concerts and a general run-down of things to do. Keep an eye on posters around town for one-off events. An ancient festival celebrating the 'marriage' of Venice and the sea, the Sensa festival takes place on 20th May 2012. A procession of boats heads to the waters of the Lido, where the Doge used to throw a ring into the waters (nowadays the Mayor throws a wreath). Venice Carnival is the biggest event of the year in Venice, and if you are planning to stay in the city at this time, you should really plan ahead and book your hotel well in advance. There are usually a number of special organised events but most entertainment is to be had simply strolling around the St. Mark's area and admiring extravagant costumes. 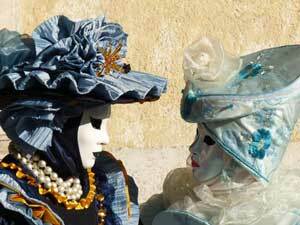 The 2013 Venice Carnival takes place between the 2nd and 12th February. This little antiques and craft market takes place several times a year, and is a good place to pick up a souvenir, curiosity or gift. 1st-3rd June, 14-16 September, 14-16 December 2012. Campo San Maurizio is on the route between Piazza San Marco and the Accademia Bridge. Venezia: The Show is a tourist event, performed every evening in a theatre close to St. Mark's Square. Actors, music and audio-visuals provide a colourful introduction to the city, as well as offering a rare spot of evening entertainment for tourists in Venice. There are ticket packages available including gondola rides or dinner at the Hard Rock Cafe. One of Venice's most heartfelt traditions is the annual pilgrimage to the Church of la Salute for mass on the 21st November.